Mea Culpa means “I am guilty”, a Latin phrase of confession introduced to the modern idiom from the Catholic Mass. Over the years Bill has publically acknowledged having fallen short before God and man in a number of areas as he has sought to correct faults that have been brought to his attention. There are those who have accused him of a great many other things, things he has not assumed responsibility for. This has been a grief to those attempting to see the justice they understand to be required, done. Many have helpfully undertaken the task of writing out statements and confessions for him, presenting them to him for consideration, signature, publishing. When those “confessions” are not accepted by Bill for that purpose, the authors often feel that the value of what they consider an important and creative contribution for the benefit of Bill and others has been lost. Often they will pass it around for others to consider . . . so, of course, they may see the wisdom of what should have been. Unfortunately these “confessions” end up circulating around and, sometimes years later , will surface as statements that Bill has himself put forward. One of these has just surfaced in the pending lawsuit against Bill as “Exhibit B”. Exhibit B has stirred considerable interest because it uses words and phrases such as “my guilt”, “my hypocrisy “, “ungodly and sinful”, “sinned against young ladies”, “breaking a trust to protect them”, “I sinned”, “I have caused great destruction”, “I do not deserve to be forgiven”, “confess my sins against you”, ending with the decidedly non-Billism: “Grateful that you would take time to read and consider this request”. Juicy stuff indeed for any lawyer seeking to accuse Bill of negligence against young women, as the suit alleges. We understand why this would want to be inserted into the lawsuit. But we checked with Bill and this is not a statement he ever created, would ever have approved, signed, or published. It was created by others during the time Bill was actively working with Dr. Murphy who was seeking to help facilitate the reconciliation process. Whether it was Dr. Murphy or someone else, this “confession” was presented to Bill for signature and publishing . . . and rejected. At some point someone gave it to Dr. John Cornish of Recovering Grace, who presented excerpts from it to us last year, prior to the lawsuit being published. We explained to him at that time that this was not Bill’s statement. Somehow, however, it got into the hands of David Gibbs, attorney for the plaintiffs, who then published it in the lawsuit. It is noble and noteworthy when someone makes confession of a sin, assuming responsibility for what they have done. It is reprehensible and disingenuous to publish a statement written as though it were a first hand confession of someone else, but isn’t, putting words in their mouth. Tua Culpa, “You are Guilty”. May the Lord see and straighten this out. I am not sure why you want to drag the Catholic Church into this mess but I think you are trying to make some sort of case for Bill that he has “confessed” his sins to others. 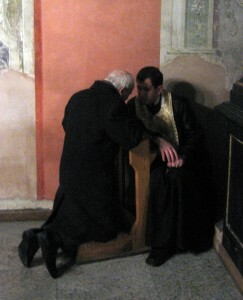 The sacrament of reconciliation is really much more that just “confession” to a priest which is always private to the priest to begin with, the priest in “persona Christi” which means the priest is representing Christ as part of his ordination offers absolution on behalf of Christ for confessed sins and makes suggestions for a “penance” which is a form of restoration to complete the forgiveness of sins and meant to make right the wrongs. Bill’s repeated “confession” sessions he forced on his staff is a perversion because public group forced confession sessions is not confession, is not reconciliation and only opens the door for others to use the confessed sins as gossip and does not bring any healing for the sinners. 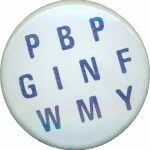 If Bill didn’t write “B” then he needs to get a lawyer to say so, not use you to put that out on the internet. Stating and going around that Bill wants to hear how he has “offended” others isn’t confession either. If Bill really is “confessing” his sins towards others, he would state and go to those he has sinned against not to those he “offended” in his use of words. Writing on his web site that his bottom line sin is not meditation on the Bible enough is not a confession of sin because that isn’t a sin such as lying, immorality, pride etc. If your point is that Bill has “confessed” his sins so we just now need to leave him alone is a bogus defense. If Bill has really confessed his sins, not his “offenses”, then he would be in the process of reconciliation with others which was the purpose of meeting with Tony and Larne etc in Denver. All of this is just spin and a continued cover up. This isn’t “real” confession and reconciliation and restoration. Repeatedly called sins offenses put the blame on the other because it implies they were offended not they were wronged by sin. Again, I’m not sure why you need to drag the Catholic Church into this. You don’t understand what the Catholic Church teaches except your posted picture of a priest hearing someone’s confession. That is why this is called the sacrament of reconciliation not confession because it more than just confession to a priest and it involves a whole process meant to restore a person back to God and their fellow man with the aim of healing relationships with God and our fellow man. There is obviously no healing and restoration here with Bill and those he has sinned against and that is why he is headed to court. If Bill didn’t write “B” then he needs to get a lawyer to say so, not use you to put that out on the internet. A lawyer would say that in court. And Bill didn’t know we were posting this. Just for the record. There is obviously no healing and restoration here with Bill and those he has sinned against and that is why he is headed to court. Well, that is not his fault. His door, phone, and email have been wide open for two years now, he pleading for the offended to make contact. A number of these women have made no attempt to take this up with either Bill or IBLP. Some told Bill they would not talk to him until he publicly confessed that their stories were correct, which is sort of a guaranteed impasse. Some were in touch and actually formally forgave him for the very offenses they are now suing him for. Some openly declare in the lawsuit that they can’t remember what Bill did to them, but sued him anyway. Some openly acknowledge being happy with life and Bill . . . until the “Whisperers” of RG caught up with them and wounded them. So forgive me for a smidgeon of cynicism. Any reference to the Catholic Church is purely incidental, stemming from the phrase “Mea Culpa”, which they invented. The Catholic Church didn’t “invent” Latin just for the record. No, but they invented “Mea Culpa” as far as the English idiom is concerned. So you invented Tua Culpa? I attended Basic Youth Conflicts and a conference for ministers several times in the 1970s and 1980s. Although I liked and believed most of what was taught, there were some things I questioned. Some time ago, I found the Recovering Grace website and was very interested. At first, I thought they were on the right track, and that Gothard had probably been too subjective, reading some of his own preferences into the stricter teachings. I always believed all the stories written by the young ladies, and felt sad about them. I could only assume that he was a very lonely man who should have gotten married. However, Recovering Grace also published letters from Gothard attempting to reconcile with them – and then gave their response, which basically stated they would not reconcile with him until he admitted up front that he was 100% guilty of all accusations, and that even the things he taught all these years were wrong. The more I saw of Recovering Grace, the more uncomfortable I was with the disrespect and bad spirit I sensed, and it appears to me now that their real problem with him is that they don’t like what he teaches. I am no longer convinced that all those ladies’ stories are completely true. And I’m glad to have found very recently that there is now a counter-site called Discovering Grace. DH – could you elaborate on the letters RG published from Mr Gothard and the responses? If not in detail, could you just direct me to the article(s) they’re in? Also – you mentioned that RG has a problem with Mr Gothard’s teaching, then you said you question some of the ladies’ stories, but I’m not sure how you went from his teaching to their stories. Could you elaborate on this, too? Thanks. Whoever is right or wrong, it seems that Gothard was attempting to find reconciliation with these people, but they were deliberately complicating it. I doubt that reconciliation is what they want, only the destruction of Mr. Gothard. I would be thankful to be proved wrong. Remember, I am not in agreement with everyone Gothard has taught. But I believe a person can be my brother without having to be my twin. Most of what I saw in the stories by the young ladies was quite believable and in fact, he has acknowledged as much. I am confident most of it is true, but I don’t believe some of the outlandish claims, such as one who claimed that he “filled her up,” or the one who said he gave her a passionate kiss. When someone wants to put another person out of ministry, they will often pile on, recruiting others, making exaggerations, etc. What is the motive of Recovering Grace – to help bring healing to all involved or to cause grief? Only the Lord knows for sure. But the Lord is in the business of healing, not destroying. Sir, I read the correspondence thru the link you posted. I appreciate RG posting that. Bill should have responded to the final email. That said, RG should have met with Bill. Meeting for the purpose of reconciliation should include Bill being given the opportunity to see the RG team face to face, talk without the restrictions and delays of email, and be able to perceive tone, etc. – this may have opened door to repentance. 1. First of all, when was this thing written? Recently? 2. If Bill didn’t write this thing, then who did? Recovering Grace? Dr. Murphy? Someone from IBLP? 3. Assuming they didn’t write it (correct me if I’m wrong), how did Recovering Grace get their hands on it? 4. Why would Recovering Grace send it to Discovering Grace? Seems odd for them to be communicating with a site that is tearing them down. We believe in 2014, when Dr. Murphy was working with Bill on reconciliation. Bill told me Dr. Murphy wrote it. The understanding is that Dr. Murphy was seeking to open doors of cooperation with Recovering Grace and provided it to Dr. Cornish, perhaps “shopping” it, to see, should he succeed in getting Bill to approve it, whether RG would get behind the reconciliation process and facilitate access to the women that Bill was unable to otherwise contact. Dr. Cornish was communicating with a Moderator of the Bill Gothard Facebook page prior to the launch of DG seeking to encourage the team to stop supporting Bill. He gave excerpts from this statement to support that goal. Have you corroborated all of this with Dr. Murphy? Seems it would be easy enough to do. Have you corroborated all of this with Dr. Murphy? No, we have not. You are right, we should do that. We do not have contact information but will seek to secure that. Again Alfred you make lot of statements without checking the facts! We disagree with you. We are constantly crosschecking facts! 🙂 What concerns you? His contact information is in the very exhibit you are challenging, so please don’t pretend you don’t already have it. Dr. Murphy is a good man, and knowing that you essentially implicated him in a conspiracy without speaking to him bothers me greatly. Well, we started with what we know, that Bill did not write the exhibit. As indicated in the post, we were not sure if Dr. Murphy did, although that was Bill’s recollection. The conspiracy, if true, involves whoever supplied the “confession” to attorney Gibbs. If RG, they definitely knew ahead of time that this was not Bill’s statement. But now is the right time to clarify that. And, no, we missed the email in the Exhibit, being too focused on the contents. Can you share with me why Bill is needing someone else to write on his behalf something as deeply personal as a “confession” or “apology”? It seems to me that those wounded are searching for a show of true love, genuine understanding, and sincere repentance for *whatever* has been done in the past. This can’t come from someone’s else’s hand. The offended will see right thru that. If Bill can write 6 new books, shouldn’t he write his own apology? Part of the reason behind the current law suit seems to be not the actual allegations, but the fact that people felt ignored. It’s never too late to be sincere. And you are right, if what you are saying is true about this document being purposely misused, that is a shame. Both sides must choose to act honorably. Can you share with me why Bill is needing someone else to write on his behalf something as deeply personal as a “confession” or “apology”? There has been a large focus on some of the accusers not getting involved in reconciling until they saw a confession that they liked. I think that is what was going on. Some wrote, others, including Bill, critiqued and made changes. Another team made up of folks from the 1980s also created a statement – several, actually – that were given to Bill for review with the intent to publish. The two statements that he did publish were, again, substantially different from any of those. Those statements were all his. Are these two the statements currently on his site? The 2nd statement is found on his recently rebuilt site, http://billgothard.com . The first statement is archived “out there”, I am quite sure it is on RG somewhere. Non-Billism! What a hilarious label! Like many public figures, Bill Gothard has unique verbal tics. I agree that “grateful that you would take time to read and consider this request” does not sound like Bill Gothard. A pastor or religious bureaucrat may use such terms, but not Bill Gothard.